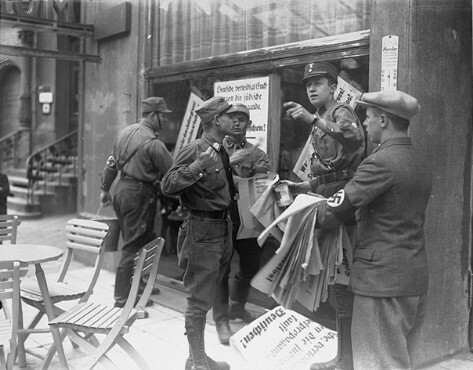 An SA member instructs others where to post anti-Jewish boycott signs on a commercial street in Germany. A German civilian wearing a Nazi armband holds a sheaf of anti-Jewish boycott signs, while SA members paste them on a Jewish-owned business. Most of the signs read, "Germans defend yourselves against Jewish atrocity propaganda/Buy only at German stores." Germany, ca. April 1, 1933.